I am looking for a good rust free core support for my 1973 Chevelle. Please PM me. Thanks! Anyone know if they were the same thru '77? How about same as El Camino and Montes? My Hollander Interchange doesn't list Core Supports...and, last time I asked the guys at the salvage yard that specializes in old cars...they didn't know, either. 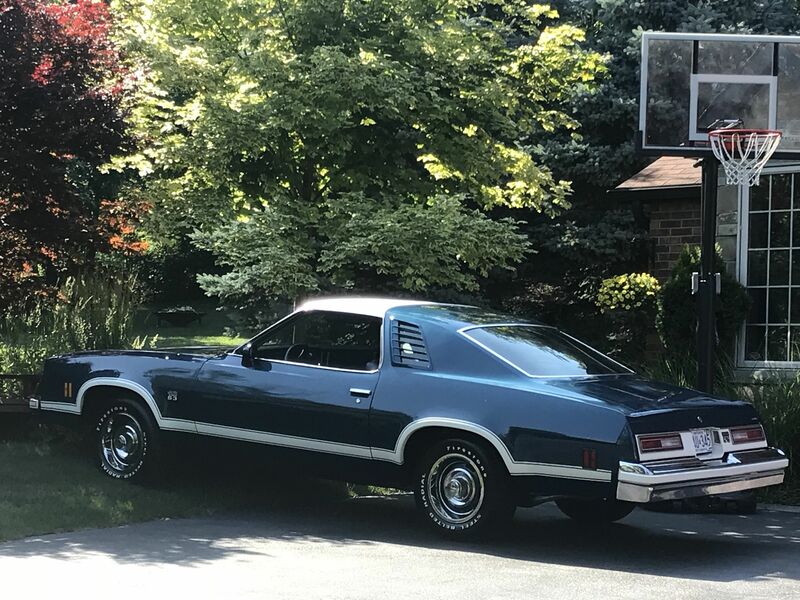 Anyway, there are a couple of rust-free Montes & El Caminos sitting up here in MN if we could confirm. This doesn't answer the question of whether the '75-'77 can be used on '73/'74 and vice versa...although, I'd bet they could. This would also indicate that dual vs quad headlights are irrelevant. O.B.O.!! Bet $75 takes it. I believe a deal has been struck. I am checking some numbers for a core support and found this in the parts book. It says a 74 "pass" will fit a 73/74 chevelle? "Pass" has always referred to the full size line, at least I think it does. If I am reading this right, a core support from a 74 caprice/impala (non 454) will fit a 73/74 chevelle? (red mark on pic). What do you guys think? Am I reading this wrong? part #359915. I get confused with the parts book as well. That number isnt skipping to the next line. The 73/74 part number is just for the chevelle. I've run into that a bunch of times in Gm parts books. The way you read that is "Pass" (exc 454) and next line "Pass" (454) (exc HD Rad) are combined to fall under the part number to the right...which is hard for me to read on my laptop, but looks like 344480? 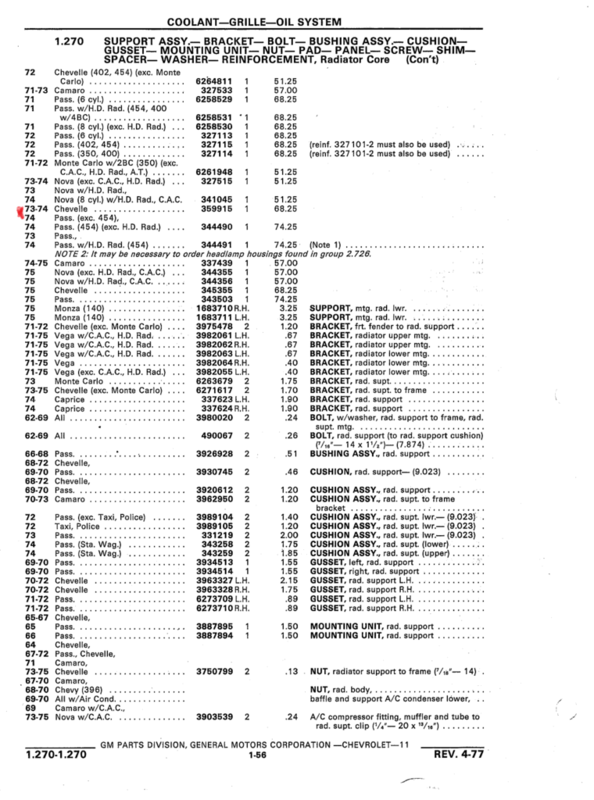 Then, the next line after that would take care of the previously excluded Pass w/HD Rad & 454 is part number 344481 (can't read that one very well, either)? But, to answer the previous question...I seriously doubt the full size "Pass" rad supports are interchangeable with Chevelles. It is hard to see the "enlarge image" at the top of the white. You should be able to blow it up. I understand now. I thought the "Pass (exc 454)" would follow under the chevelle part #. Also the numbers to the right are the price? $68.25 for a new core supp? Yes, sir...back in the day. So I would say that B-body and A-body cars use different radiator supports. The key here is to take notice of where they put the commas at. I have read enough parts books in my day of selling parts, both in the dealers and for major parts companies, to know that one can get into trouble quickly by reading things wrong. Yep 73-74 are the same unit.. I have the old core support off of my 73 Chevelle if anyone is interested. Probably driver quality at best (it does have some welded areas on it). Will only ship uship.com or a similar service because I have no way to move this part via vehicle. I can email pics if anyone is interested. For folks that are into body work etc, rebuilding one shouldn't be too difficult. That's what I had to do... I used 16 Gauge sheet stock for repairs. I have a unit from a 76-77 Monte that has been in storage for 20 years. Thanks guys for the schooling on this. It does look like the comma is the key. I looked at that 10 times and didn't notice the comma. Makes perfect sense now. This will help with future part look ups. My support is OK, driver quality that has been repaired under the battery. I basically have everything except for the support to put the car back together if I were to get into a accident. I'm going to think on that NOS unit that is offered. I had the car painted a year ago. I should have found a better one then. I have a good used one from an East El Paso TX U Pull it yard.